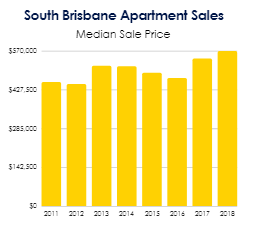 South Brisbane is an inner city suburb of Brisbane, located directly on the southern bank of the Brisbane River, and famed for its premier lifestyle and entertainment offerings. The area gained popularity after the 1988 World Expo was held at South Bank Parklands. Following the Expo, South Brisbane emerged as a fashionable and modern residential area. As home to the State Art Gallery, Convention Centre, Museum, a man-made beach and a multitude of diverse restaurants, South Brisbane is a must-visit spot for anyone who comes to Brisbane. Due to South Brisbane’s central location, residents are spoiled for choice when it comes to public transport. The South Bank Busway Station is a hub for locals, services by 44 different bus routes, and connecting them across all directions of the city. Train stations are within easy walking distance with one located at Southbank and the other at South Brisbane. And not to mention CityCat stops at Southbank. 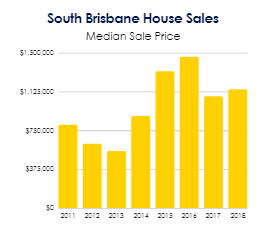 South Brisbane covers approximately 2 square kilometres and its six parks (Southbank Parklands, Musgrave, Clem Jones Promenade, QEII) occupy a generous 8.8% of the total area. The area is rich in culture, with many ethnicities represented. Cultural events that are celebrated annually at Southbank include: Buddha Birth Day Festival, French Festival and Austrlia Day Fireworks. Households in South Brisbane are primarily professional couples (aged 20-29 years) and there are also many young families drawn to the great local atmosphere and strong reputation of its local schools including, Brisbane State High, St Laurence’s College and Somerville House. Demand for houses in the area is huge as the relaxed lifestyle, close proximity to the CBD and access to quality schools in the area is extremely attractive to young families. Due to these reasons and the scarcity of the of houses available in the area, we predict that the remainder of the year will see median house prices stay at similar levels. With the construction of several new apartment complexes in the area being completed, it appears that prices are remaining strong. With a median price of under $550,000 buyers are keen to be part of the action and are seizing the opportunity to own so close to the City. Potential owner occupiers love the South Brisbane entertainment and dining options whilst investors can look forward to earning some great rental returns and future long term growth. After a period of stagnation due to the construction of several apartment complexes, the rental market has begun to show signs of improvement over the past 6 months. Median rental prices look to have stabilized at $640 for houses and $550 for units, which reflects a slowdown in new developments both in the suburb, and also in surrounding areas. Changes in rental yields for both houses and units have mirrored each other over the past decade, however recently rental yields for units has improved, while houses have remained stable.